Clearance Sale on All Summer Clothing! Deals on all winter clothing! Download the Artist Application & Guidelines HERE! New Location! Gettysburg Fire Hall on Stratton Street. Enjoy a wonderful pasta dinner, salad, bread, drinks and dessert. Silent Auction will include baskets and gift certificates; there's something for everyone and a great time to start Christmas Shopping! Tickets available now. Adult $10, ages 4-12 $5, children 3 and under eat free. At the door, tickets increase to $15 for adults, so BUY NOW! Buy one get one free ALL week! Special discounts on furniture and jewelry. CRAZY DEALS! Stop by the ARM Boutique on Saturday, June 30 from 1-4 pm to meet and greet some of Gettysburg's top historians/authors. We will have a limited number of their books available for purchase, and they will be signed by the author! Featuring 1920's music by the KJO Two-Beat Dames. Held at The Barn at Herr Ridge Farm, Gettysburg. Light hors d'oeuvres will be served throughout the evening. Dress in your best 1920's attire! $35 per guest. Sponsor a family or child for Christmas! Contact Jenny Punchard for specific information about a child or children today! You'll have the fun of shopping for a family in need. December 2, 7-9 pm at Boyer Cellars (405 Boyer Nursery Road, Biglerville, PA 17307) In 2 hours, you’ll be guided through the process of painting this picture! Get some friends together, and paint for a cause! Food provided by the ARM, drinksmust be purchased through Boyer Cellars. At this event, YOUR donations will make an even bigger impact! Gifts made to the ARM at the Giving Spree will qualify for MATCHING FUNDS from the Adams County Community Foundation! Also, every person will receive a $10 coin to spend! You can give at the Adams Rescue Mission (2515 York Road, Gettysburg), From 10 am- 2 pm, on November 9, and those gifts will also qualify for the matching funds! Mail it in, or stop by to drop off a check (payable to the Adams County Community Foundation & dated November 9, 2017), meet some of our staff, enjoy a cup of coffee, tour the Mission, and browse our thrift store. You can go online on NOVEMBER 9 (www.adamscountycf.org) and designate a gift to the Adams Rescue Mission through the Adams County Community Foundation’s Website. These gifts will also be matched with the Matching Funds! On the Gettysburg Square August 4 from 4-8 pm, we will be holding an Ice Cream Fundraiser! Stop by for a bowl of Mr. G's Ice Cream, or a rootbeer float and support the ARM! Pottery bowls can be purchased in advance with the link below, for $20. On the Gettysburg Square July 7 from 4-8 pm, we will be holding an Ice Cream Fundraiser! 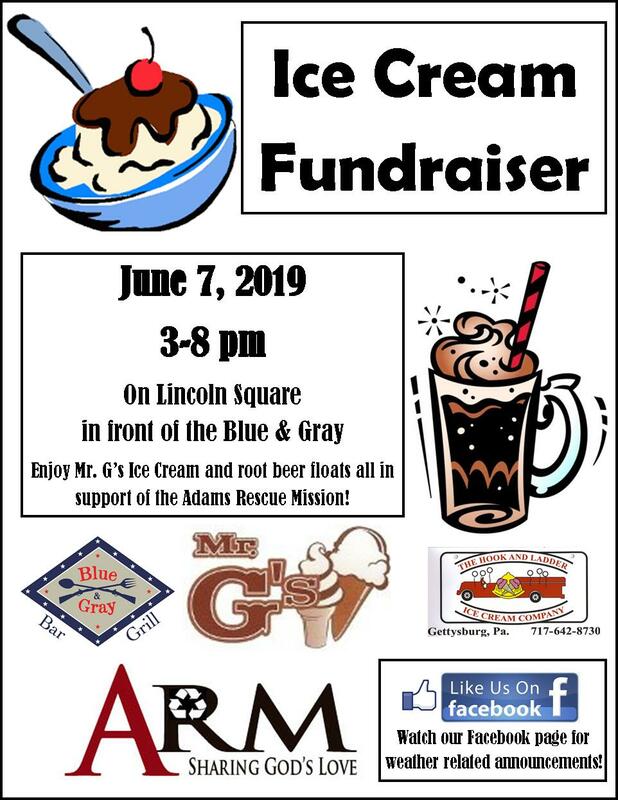 Stop by for a bowl of Mr. G's Ice Cream, or a rootbeer float and support the ARM! Pottery bowls can be purchased in advance with the link below, for $20. On the Gettysburg Square on June 2 from 4-8 pm, we will be holding an Ice Cream Fundraiser! Stop by for a bowl of Mr. G's Ice Cream, or a rootbeer float and support the ARM! Pottery bowls can be purchased in advance with the link below, for $20. Join us! This FUNdraiser will be an afternoon to remember! $15 per ticket, lunch included. At the Intersection Church, 1980 Baltimore Pike, Gettysburg PA 17325. Join us for lunch, a tour of the facility, meet the staff, and get all your questions answered about the Adams Rescue Mission! Please call us at 717-334-7502 x 0 to reserve your FREE seat!